— Zodiac theorists Gareth Penn, Steve Hodel and Raymond Grant promote the theory that the Zodiac crime scenes formed a geometric angle known as a “radian,” yet none of these men can accurately locate the crime scenes on a map. That fact is simply stunning. I was curious to discover what the Zodiac had meant by this rather bizarre suggestion. I bought a sheet of clear acetate and a marking pen. 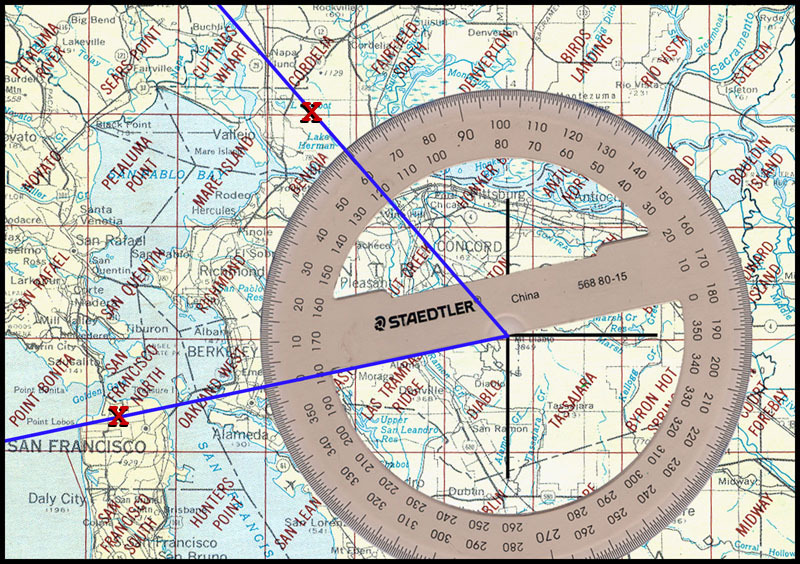 Using a protractor and a straightedge, I drew and angle of between 57 and 58 degrees on the acetate and then the acetate over a map of the Bay Area. I placed the apex of the angle on Mount Diablo, then rotated the angle until one leg passed through the scene of the murder at Blue Rock Springs. Then I felt as if a ton of bricks had fallen on me. The other leg of the angle went straight through Presidio Heights in San Francisco where the Zodiac had murdered the cabby. It was the most shocking experience of my entire life. 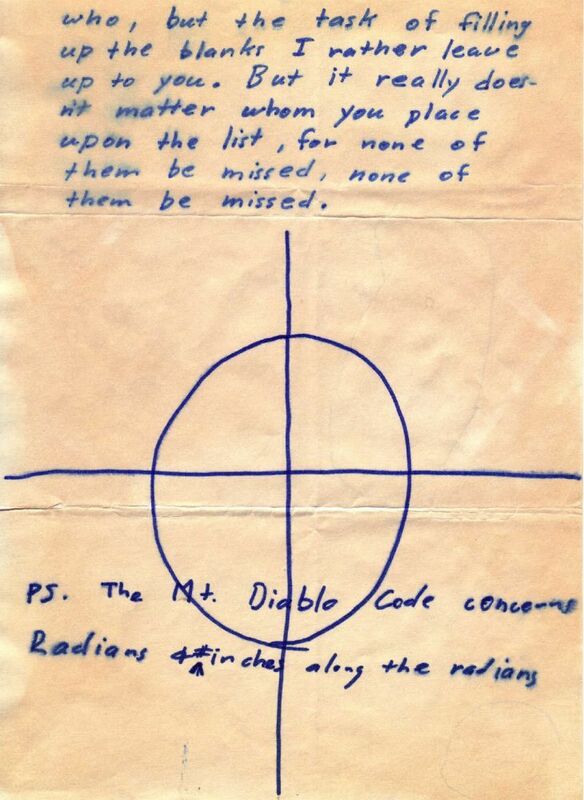 Penn had proposed a provocative solution to the Zodiac’s Mt. Diablo mystery by suggesting that the Zodiac had not only pre-selected the locations of the crime scenes based on some plan to construct a giant geometric angle but that the killer’s last known victim, cabdriver Paul Stine, was directed to an exact intersection where he was then murdered in order to complete the radian. The discovery of “the radian” generated attention for Penn and served as the foundation for his subsequent theories concerning the Zodiac’s methods, motives and identity. Penn’s radian theory was later adopted by other Zodiac theorists, including Steve Hodel and Raymond Grant. According to Grant, Gareth Penn and his suspect, Michael O’Hare, had conspired to commit the Zodiac crimes along with other co-conspirators. Like Penn, Grant cited the radian as evidence to support his claims, conclusions and theories. Other versions of radian theories were also promoted by Zodiac theorist Dennis Kaufman and others. Penn’s radian theory became a prominent part of the Zodiac legend and was promoted by many believers, including Zodiac researcher Jake Wark and myself. During my 1999 appearance on the Learning Channel documentary Case Reopened, I explained the radian theory. My endorsement of Penn’s radian theory was later cited by Grant and others in support of that theory. However, my presentation of the radian theory was largely influenced by and based on Gareth Penn’s previous presentations. As a result, I had no idea that my presentation was actually severely flawed and inaccurate. In later years, my own desire to find the truth about the radian theory compelled me to re-examine the facts and to reassess my own beliefs. I had long-believed that the radian theory was valid, but my renewed research forced me to conclude that I had always been wrong. 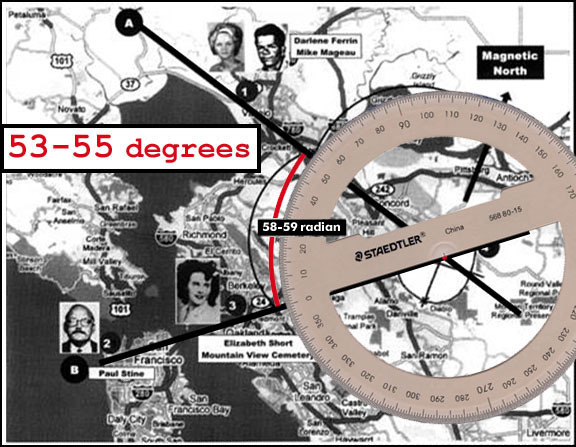 Penn claimed that the crimes scenes at Blue Rock Springs in Vallejo and Washington and Cherry Streets in San Francisco formed an angle measured at approximately 57.3 degrees, or one radian. In his book, Penn stated that the Vallejo crime occurred at the Blue Rock Springs golf course. However, the shooting actually occurred across the street and further East of the golf course in the parking lot of Blue Rock Springs Park. 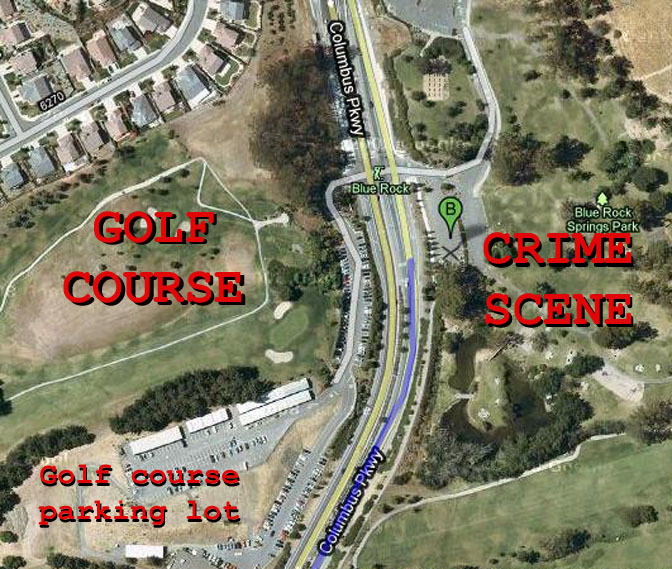 The golf course and the actual crime scene (marked “B”). Penn was mistaken regarding the actual location of the Blue Rock Springs crime scene, an error which cast doubt on his radian theory and resulting conclusions. Some defenders of the radian theory suggested that the distance between the golf course and the park was insignificant when assessing the accuracy of the radian theory, but any Northeastern movement of the crime scene creates a geometric angle which is larger than previously measured from the golf course. The problem was further compounded by the fact that Penn’s illustration of the Zodiac’s radian was incredibly inaccurate. For some reason, Penn placed the Blue Rock Springs crime scene more than four miles west of the correct location. This erroneous placement of the Vallejo crime scene did permit Penn to draw a radian angle from that scene, the San Francisco crime scene and the peak of Mt. Diablo. However, the inaccurate placement of the crime scene cast further doubt on Penn’s claims. An obvious irony was always evident in Penn’s illustration, an irony which I had previously failed to notice and still remains unnoticed by those who continue to promote Penn’s radian theory. Penn’s incorrect placement of the Vallejo crime scene compared to the correct location. Penn’s placement of the Vallejo crime scene was incorrect by several miles but his measurement from that incorrect location did form a radian angle. Yet, Penn’s illustration proves that a radian angle drawn from Mt. Diablo and the San Francisco crime scene does not pass through the Vallejo crime scene and completely misses the entirety of Blue Rock Springs Park as well as the adjoining golf course. Those who defended Penn’s theory often argued that the measurement of the radian was at least accurate regarding the entirety of Blue Rock Springs Park but the facts proved otherwise. Put simply, Penn’s own illustration proved that his theory was wrong. Like many of those who promoted the radian theory, I was willing to accept a certain amount of inaccuracy regarding the measurement of the locations in question. I was wrong about the accurate location of the Vallejo crime scene and, therefore, the margin of error I had agreed to accept was greater than I realized. The angle created by the three locations was approximately 60 degrees or more, much larger than a radian of 57.3 degrees and that margin of error was too large to ignore or explain away as a simple mistake. A U.S Geological Survey map with the correct locations marked at the peak of Mt. Diablo, the crime scene in San Francisco and the crime scene at Blue Rock Springs Park. The resulting angle measures approximately 60 degrees or more, larger than a radian of approximately 57.3 degrees. 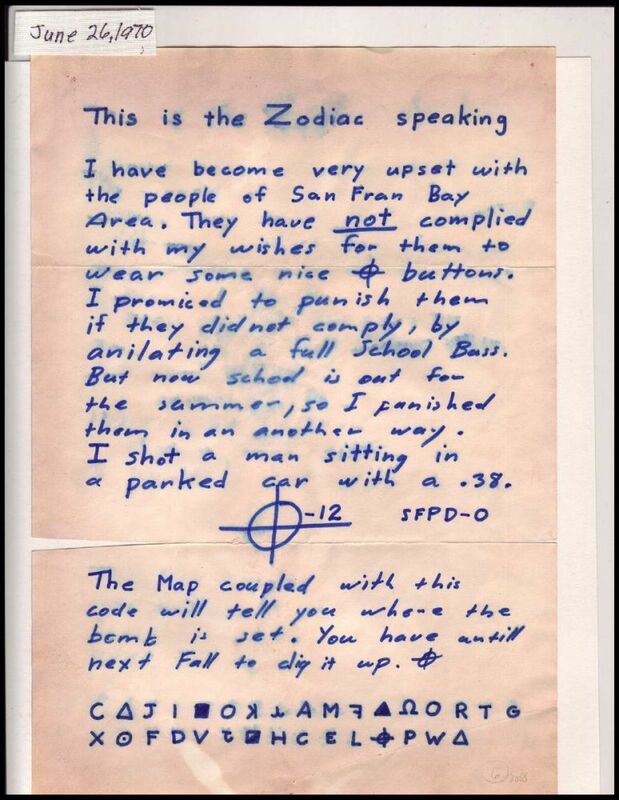 Some defenders of the radian theory suggested that the radian was not meant to be accurate and only concerned the general locations of Blue Rock Springs Park and the Presidio Heights neighborhood in San Francisco where the Zodiac murdered cabdriver Paul Stine. However, the facts once again demonstrate that any angle based in the general area of Presidio Heights will not permit the other leg of the radian to pass through any portion of Blue Rock Springs Park, and vice versa. The facts proved that the radian theory was not valid. Gareth Penn was wrong, I was wrong, and so was anyone else who had ever promoted that theory as valid. Admitting errors is difficult for many people, but I conceded my mistakes and posted a public retraction of my endorsement of the radian theory at the ZodiacKillerFacts.com message board. That post also included an accurate presentation which proved that the radian theory was not valid. After the facts proved that the radian theory was not valid, I retracted my endorsement of that theory and so did others. Jake Wark had since departed from the online community and did not comment on the issue, however, having studied this theory with him in the past, I believe that Jake would also concede that the radian theory is not valid. The Zodiac may have been attempting to create some sort of geometric construction by choosing specific locations for his crimes, but the evidence proved that the radian theory was wrong and that its promoters were wrong regarding the actual locations in question. 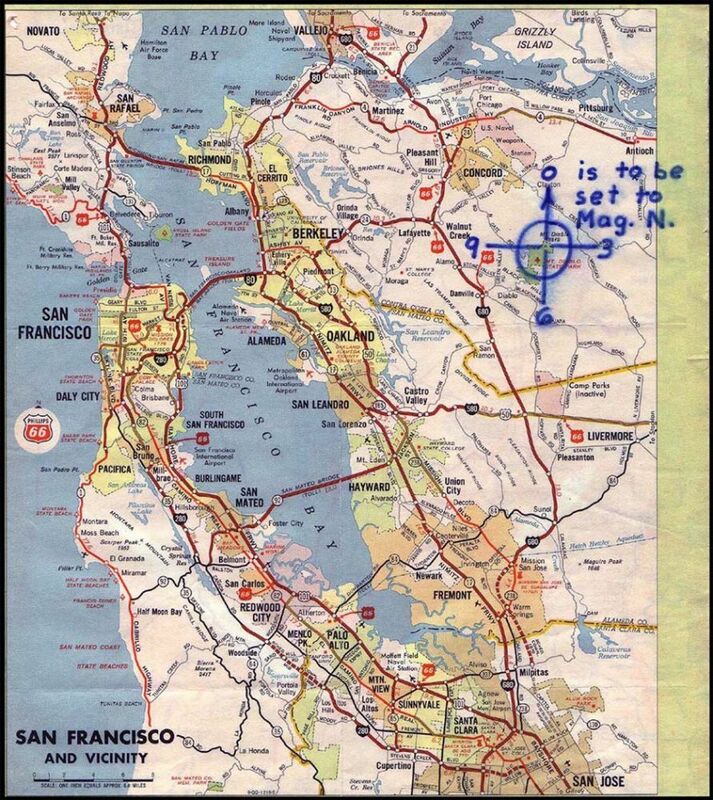 It’s true, of course, that you can find a map somewhere that does include all three points—a map of northern California, for example. 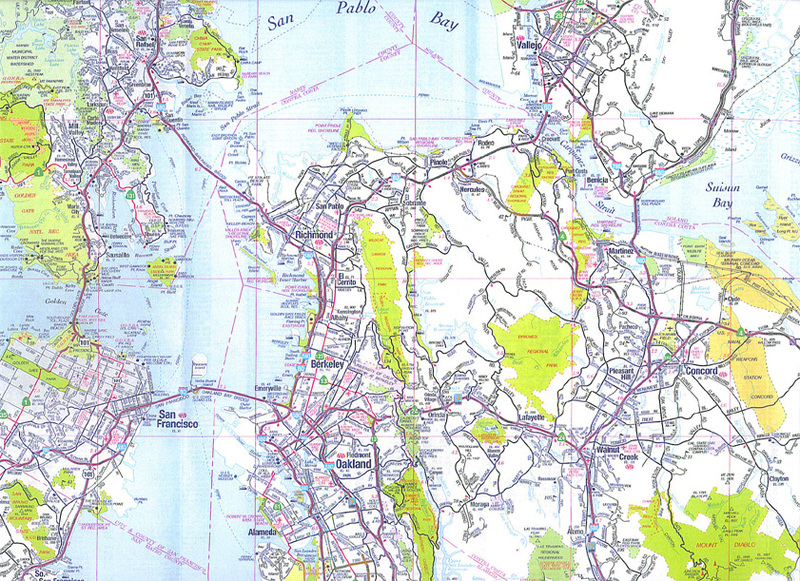 The problem is, a map which covers an area large enough to include all three points will not allow for enough recognizable detail to pinpoint the murder sites in Presidio Heights and Blue Rock Springs with any degree of accuracy. The legs of the radian go through Presidio Heights (the neighborhood), Lake Herman Road (the rural road), and Blue Rock Springs (the park). Depending on how you situate the angle itself, there is a variance among the three murder sites of 1-2° on a map, which doesn’t seem like a lot considering that each leg of the angle is 35-40 miles long… As I said earlier, when one places a radian (57.29°) on a map of the Bay Area . . . with its apex on the above circled point of Mt. Diablo (VABM 3849) . . . so that the south leg of the angle goes through the intersection of Washington & Cherry Street (where Paul Stine was murdered) . . . the north leg goes through the murder scenes at Lake Herman Road and Blue Rock Springs. Raymond Grant’s claim that the legs of the radian “go through Presidio Heights (the neighborhood), Lake Herman Road (the rural road), and Blue Rock Springs (the park)” is demonstrably false. The facts (and illustrations included here) demonstrate that Grant was wrong– a radian based in Presidio Heights will not pass through Blue Rock Springs Park at all. Grant’s stated certainty on this issue seemed odd given that he, himself, had also stated that maps which featured these three locations did not provide enough detail to “pinpoint” the locations in questions. If Grant could not obtain a map which featured the three locations and sufficient detail to identify those locations, how could Grant measure a radian based on these locations and conclude, with certainty, that the legs of that radian “go through” the three locations? According to Grant’s own claims, he could not conduct the necessary research and therefore had no factual basis for his conclusions. Grant’s errors regarding the correct measurements of the locations in question are further compounded by his failure to accurately locate those scenes on a map. Like so many others, Grant apparently relied on Penn’s incorrect placement of the Vallejo crime scene as depicted in the illustration from the book Times 17. Like Penn, Grant’s illustration had incorrectly placed the Vallejo crime scene more than four miles West of the correct location. Grant also placed the Lake Herman Road crime scene approximately seven miles Northwest of the correct location. Grant’s placement of the crime scene locations compared to the accurate locations. These incorrect placements permitted Grant to measure one radian angle from the San Francisco crime scene, and the general area of the Presidio Heights neighborhood, but Grant’s illustration was even more inaccurate than Penn’s. Grant’s placement of the Lake Herman Road crime scene was nowhere near the correct location and missed the entirety of Lake Herman Road itself. Grant had promoted the radian theory as valid when he could not even locate the crime scenes on a map. Grant’s own illustration proved that he was wrong. The errors present in Penn’s work and my own previous attempts to assess the radian theory were undeniable, but the level of error in Grant’s presentations was simply stunning. Grant seemed to believe that a line drawn from Mt. 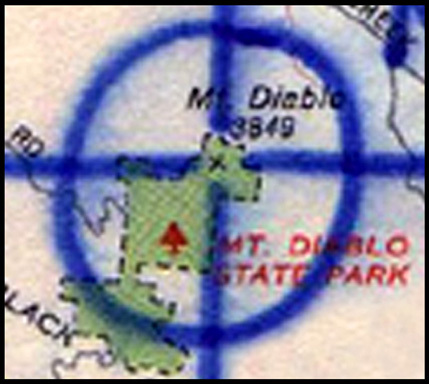 Diablo would pass through both the Blue Rock Springs Park and Lake Herman Road crime scenes. Any line drawn from Mt. Diablo will not pass through both locations, as Grant would have realized if he had ever conducted the research necessary to support his own claims. Raymond Grant’s continued promotion of the radian theory was puzzling and disturbing since the facts which debunked that theory were readily available to him for more than three years. Grant refused to accept the death of the radian theory because much of his own work was based on that theory. 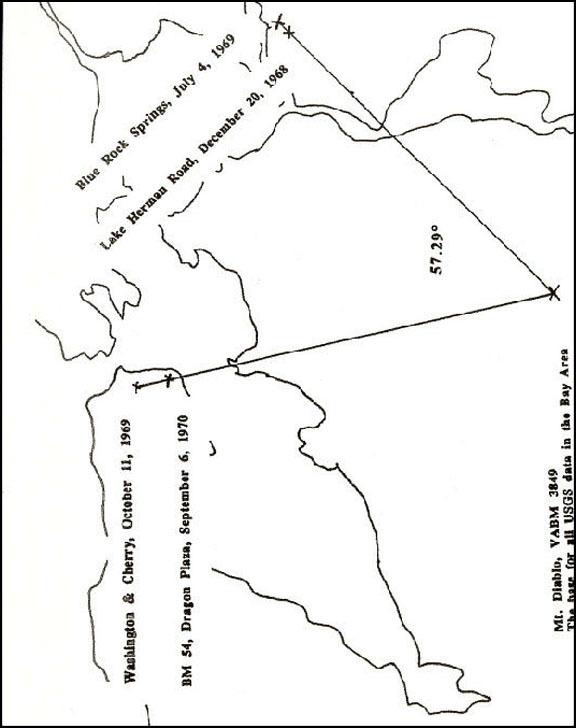 Grant wrote that the radian theory was “the starting point for the cryptographic speculation about the case,” and added, “Frankly, I don’t see any alternative to the obvious implication: The Zodiac committed those murders to create that angle on the map.” Grant refused to admit that the locations of those murders did not create that angle on a map. A simple exercise will prove that Raymond Grant is not only wrong, but that the Zodiac could not have intended for anyone to believe what Grant claims. Using the map provided by the Zodiac, one can accurately locate the San Francisco crime scene at the intersection of Washington and Cherry Streets. Then, one can accurately locate what the Zodiac obvious intended others to interpret as the peak of Mt. Diablo. 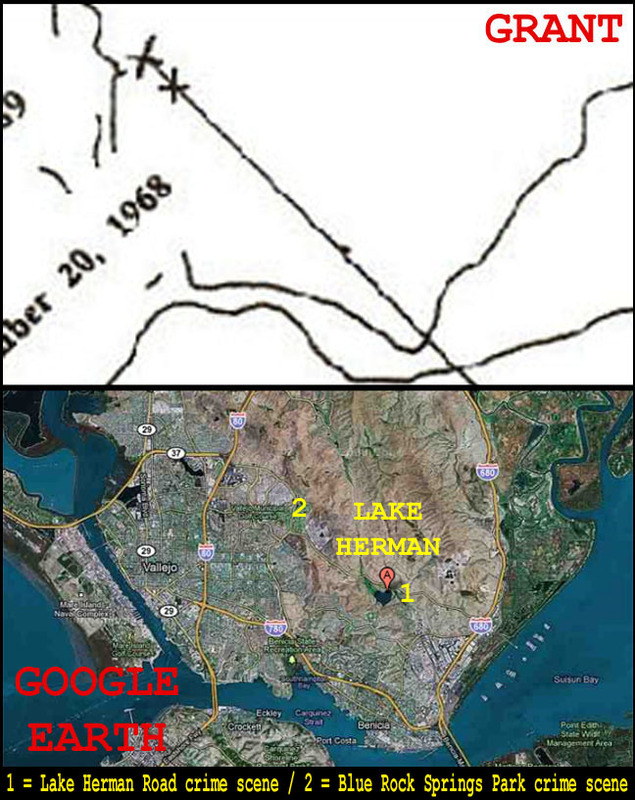 Then, one can accurately locate the crime scene on Lake Herman Road, evident by its position just East of Lake Herman. 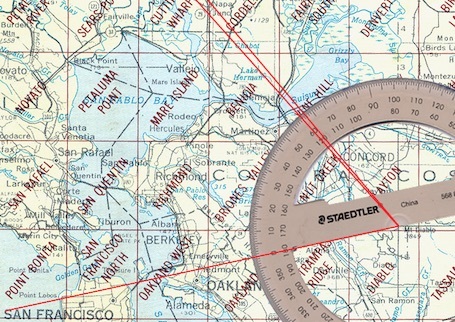 Using a protractor to measure the angle created by the San Francisco scene, Mt. Diablo, and the crime scene on Lake Herman Road, one will immediately discover that the Lake Herman Road crime scene creates an angle of approximately 62 degrees or more, far from the 57.3 degrees necessary to create a radian. The Lake Herman Road crime scene does not form a radian with the SF scene and Mt. Diablo, as the Zodiac’s own map clearly demonstrates. Therefore, the Zodiac must have known this fact if he was even moderately competent when locating the crime scenes and measuring the resulting angles. In order to believe that the Zodiac had access to accurate maps, selected the given locations, and intended a radian, one must believe that the Zodiac was as sloppy and inaccurate in his measurements as Gareth Penn, Raymond Grant and Steve Hodel. Grant’s Lake Herman Road radian theory was just as wrong as the original radian theory. At least three books promote the radian theory as fact while using that theory to “support” accusations of murder and claims to have solved the case. These three books were written by Gareth Penn, Raymond Grant and Steve Hodel. And yet, all three books are grossly inaccurate regarding the geographic locations in question– meaning, these three authors promoted the radian theory as valid and used that theory to accuse people of murder despite the fact that these three authors could not accurately locate the crime scenes on a map. That fact is simply stunning. In his book Most Evil, Steve Hodel presented several illustrated maps designed to convince readers that his radian theories were valid. However, Hodel was wrong about the locations in question and the value of the angles shown in those illustrations. Hodel incorrectly stated that a radian is a valued between 58 and 59 degrees instead of 57.3 degrees. In one illustration, Hodel’s angle was actually between 53 and 55 degrees. In his book MOST EVIL, Steve Hodel incorrectly stated that a radian was valued between “58-59 degrees,” yet the angle in the same illustration measures approximately 53-55 degrees. A radian measures approximately 57.3 degrees. Hodel’s placement of the Blue Rock Springs Park crime scene was also incorrect. The author incorrectly placed the crime scene so far West that his radian leg almost missed the entire city of Vallejo. Steve Hodel’s illustration placed the crime scene far West of the correct location. Such errors would be inexcusable in a high school book report. Hodel’s illustrations also incorrectly placed the locations of other murder scenes and even the peak of Mt. Diablo. The angles featured in Hodel’s illustrations were so incorrect that one must conclude that Hodel never bothered to check the value of those angles or he deliberately misrepresented those values in order to falsely support his claims. Like Penn and Grant, Hodel continued to insist that his theories and presentations were accurate long after they had been debunked. Raymond Grant claimed that maps which featured the relevant locations do not provide enough detail to accurately identify those locations. One must question Grant’s assertion and wonder if he has ever tried to obtain such a map. Maps which feature all three locations and provide enough detail to accurately locate the crime scenes are readily available to anyone. 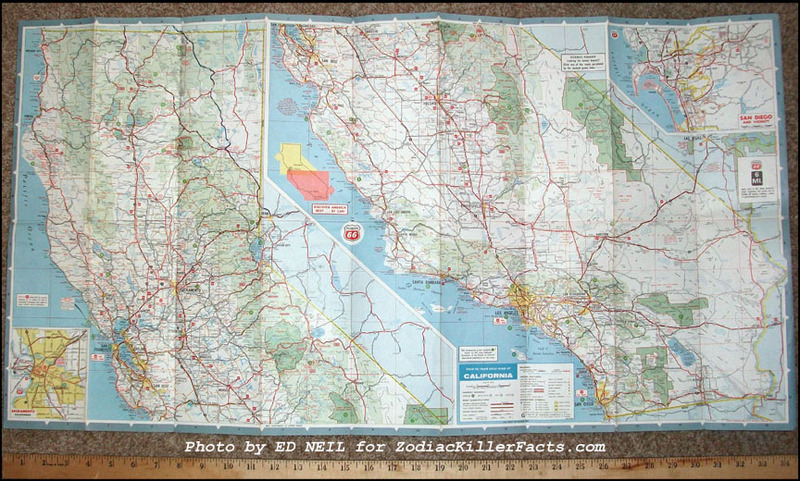 In fact, the map used by the Zodiac provided adequate detail to identify the crime scenes. The USGS map used in the illustrations included with this article provide enough detail to identify the scenes, as do most maps. Gareth Penn reportedly used a map issued by the AAA (American Automobile Association) in his radian experiments. As seen in the image below, a map issued by the AAA features all three locations and provides adequate detail to accurately identify the locations in question. The facts which debunk the radian theory are readily available to anyone who cares to look. Promoters of the radian theory use erroneous maps with the wrong locations and the wrong measurements, an irony which serves as the final proof that the radian theory is invalid– even its promoters failed to do their homework. Gareth Penn, Raymond Grant and Steve Hodel promote the radian theory, but, in order to do so, they must discard the facts in favor of falsehoods. Gareth Penn’s radian theory may have been compelling and entertaining, and, many people– including myself– may have been fascinated by its simplicity and its possible implications. At its core, the radian theory is the kind of answer so many people seek from the Zodiac mystery, some sort of explanation which would help us understand why this tragedy occurred. Like most sensational “answers” in the Zodiac case, the radian theory seems initially impressive until one examines the facts. The World According to Gareth Penn * Raymond Grant: The Zodiac Murders– Solved!